Gallstone. 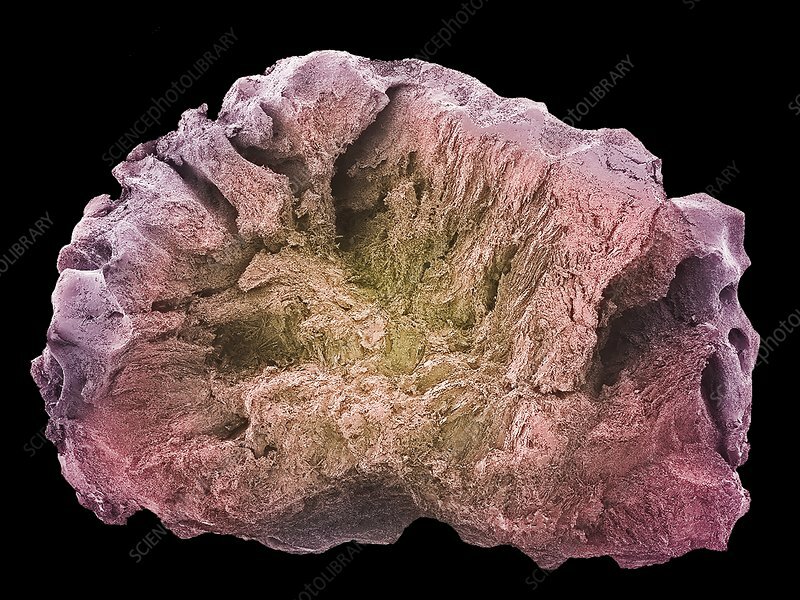 Coloured scanning electron micrograph (SEM) of a fractured whole gallstone. Gallstones form in the gallbladder. When there is an imbalance in the chemical composition of the bile, cholesterol and bile pigments may crystallise. Over time these crystals can develop into gallstones. They are usually symptomless, unless one obstructs the bile duct, which can cause acute pain, jaundice and infection. Treatment is with drugs to dissolve the stones or surgical removal of the gallbladder. Magnification: x 6 when printed at 10 centimetres wide.